Once upon a time, there was a gorgeous collection of fabrics called Central Park, made by the uber-talented Kate Spain, who's got one heck of an eye for color (have you seen Terrain?). One little quilter bought a little bit of Central Park, only to forget to buy the rest of it before it became nearly impossible to find! Fast forward several months, and that same little quilter decided to use the color palette from Central Park as an inspiration for the Pillow Talk Swap. I started with this stack of fabrics, shamelessly inspired by the color palette from Central Park. Then, after a few crazy days on something I tried to call a vacation but was really a bit more like an exercise in sleep deprivation, I decided to cut into the fabrics and make some HSTs. I didn't really have a big plan in mind, so I just kind of played with the HSTs. I started with a stack of 5" squares of my prints and some handy dandy Kona Coal, then I sewed a 1/4" seam around all four edges, and cut into four little triangles, making four gorgeous HSTs. Never done that before? Check out this video - you'll seriously have a lightbulb moment! Anyway, so after I started with the HSTs, I started playing with the layouts. I wasn't 100% in love with them at first, so I decided to shrink the size of my squares, and went down to 2.5" squares, and I really liked the change in scale, and using both sizes together. Then, I kept adding to it, and wound up with this, which I liked very much. I also had a ton of leftover HSTs, so I knew a pieced pillow back was in order. I stuck with some super simple straight-line quilting in white thread, to echo the design of the pillow front and I'm really happy with how it turned out. After much indecision, I wound up going with an envelope bag - I used up the remaining fabric I had cut for this fabric - some strips of Kona Coal, some 2.5" squares, as well as some leftover HSTs. In hindsight, I wish I had just done a zig-zag all the way across, but I think this kind of looks neat in its' own scrappy kind of way. Note: That's just some dew drops on the pillow! I'm going to be a little sad to pack up this pillow cover and ship it out - I really do love it! But...I know somewhere out there, my partner is cooking up something extra special for me, so I think I'll survive. I'm excited to see what pillow turns out to be mine, this group is full of such insanely talented women, I'm super honored to be a part of it. 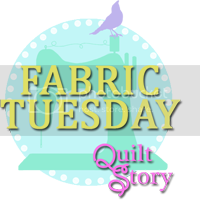 I'm linking up with Fabric Tuesday today over at Quilt Story - off to see what everyone else has been sewing up!